As we’ve noted, Chrome for Mac is getting very, very close to its official beta launch. The team is down to a mere 8 bugs to fix before it’s ready (and it looks like the list has been trimmed to 7 as of a few hours ago). This is great news for Mac users who want to try out the Chrome experience that PC users have had for well over a year now. But still, the product will be in beta, and it will be incomplete. It’s been known for a while that Google would have to trim some features from the initial Chrome for Mac beta launch to get it out before self-imposed “end of the year” deadline. But what’s on the chopping block? A scan through the Chromium logs on Google Code seems to reveal what will and won’t be a go for Chrome for Mac beta. So what’s out? The biggest feature that is currently not slated to be done in time for “milestone 4” (aka Chrome version 4, which Chrome for Mac beta will be, at least initially) is the Bookmark Manager. Current Chromium (and dev Chrome) testers will know that this option has been grayed out forever on the latest builds of the browser, and as of September, it was moved from a M4 (milestone 4) to a M5 target. It would appear that Google will launch Chrome for Mac beta without it working. Another feature moved to M5 is App Mode. This is the Chome mode that allows you to run web apps in their own basic browser window. Fans of Fluid, a free program for OS X that works with WebKit-based browsers, will appreciate this being built into the browser eventually, but it doesn’t appear that will be ready for the beta launch either. Likewise, the Task Manager has been moved from M4 to M5, but recent chatter about it makes it seem like it’s possible that it could be done in time. Gears, which allows for offline web app functionality, is completely off the table as a Chrome for Mac feature right now, according to project lead Mike Pinkerton (he actually noted this back in July). Apparently, Google plans to push ahead with full HTML5 support rather than rely on Gears, at least on the Mac. Sync for Mac (bookmark syncing) is another feature that currently works on the PC version of Chrome, but is slated to be a M5 project for the Chrome for Mac team. Still, this thread shows that significant progress has been made on it, and it looks like you can even enable it to try it out, but it won’t be on by default yet. Multi-touch gestures that are built into OS X and used by MacBook trackpads and the new Magic Mouse are another M5 project. The two listed gestures, “Three-finger-swipe up” and “Pinch in/out to zoom in/out” are still being debated as to what they should actually do. Another feature currently disabled in the Mac builds of Chromium is Full Screen mode. It would seem this too has been pushed to M5. 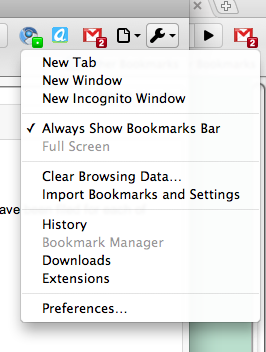 So those appear to be the big features that will be missing with the launch of the Chrome for Mac beta. There’s a larger list of other M5 projects here. Again, Chrome for Mac beta will be a M4 (version 4) release, so all of these appear to be off the table for now.